A new law forces me to have an unnecessary eye examination. Just before leaving on our historic Caribbean cruise, I realized I was just about out of contact lenses. So I ran to the store to pick up a pack of them—and ran smack dab into the government's latest foray into my personal business and none of theirs. For those of you unfamiliar with contacts, here's a brief primer. First of all, they come made of different materials, which dictate how they may be worn. 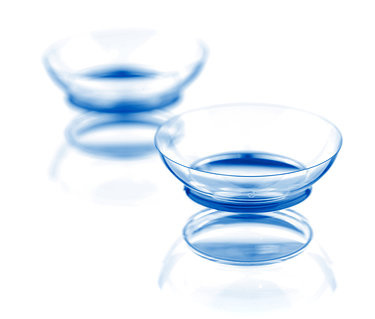 The first contact lenses were made of actual glass, and are apparently still in use, judging from the fact that you can still buy cleaning solutions and special lubricants for them at Wal-Mart and most pharmacies. Since I don't think they can be purchased—no optometrist has ever offered them to me as an option—these products indicate the original glass lenses from the 70s must still be in use. So, practically speaking, they would be purchased once and used forever. Why not? Glass is a pretty tough material. American industry abhors anything you buy once and use forever. There's a light bulb still burning in Livermore, California after more than a hundred years; but you'll be lucky if a bulb you buy today will still be working in twelve months. So, of course, by the 1980s soft lenses that could only be worn 30 times or so before replacing them were in common use; that's when I started wearing contacts. And in 1999 silicon hydrogel contact lenses were introduced. These had the advantage to the consumer of being able to be worn all day or even for days at a time (versus a few hours for the rigid lenses) and of passing oxygen through to the cornea of the eye. They had the advantage to the industry of needing to be constantly replaced. The recommendation is that they be worn no more than three times, though I wear them (without harm) for a couple of weeks. Those are the kind I wear now. You can't legally get contact lenses or, for that matter, most corrective eyeglasses, without first getting permission from an eye doctor. This permission is called a "prescription" and is just like the prescription you get from a medical doctor in order to take antibiotics or serious painkillers. Now, I actually understand the hazards of misusing antibiotics; overuse (especially when combined with not taking them for a full course) can exacerbate the development of new, drug-resistant strains of disease. However, eyeglasses can't be misused and neither can contact lenses; if you try to use them improperly (like keeping them in too long) they hurt and you are motivated to remove them. Nevertheless, I had a prescription for my contact lenses and so arranged to stop by Wal-Mart's Vision Center a few days before leaving on our trip. At that time, I was down to my last pair, which were in my eyes; it was time to replace them anyway. However, the woman at the Vision Center, after squinting at my records in her computer, informed me that she couldn't sell me the contacts. "And why not?" I asked. "You're prescription is almost a year old," she explained. "It expires within eight days. And since a pack of contacts will last you longer than eight days, I can't legally sell them to you." I stared at her through my aging contacts. "You can't be serious," I said. She pursed her lips. "It's a new Arizona state law. It's out of my control. The computer won't let me." I have no objection to having my eyes examined, when I feel it is necessary. But this completely arbitrary intrusion into a matter that should have been between me and my eye doctor was completely unreasonable and, moreover, had clearly been brokered by people who were neither me nor said doctor. I stalked out of the Vision Center, got into the car, drove to a different Wal-Mart, entered its Vision Center, and bought a pack of contact lenses without incident. Except that, now, I was pissed. This whole intrusion of government into whether and how well I can see is so clear an example of governmental intrusion in general. Republicans claim to support smaller, non-intrusive government; a plank of their platform with which I totally agree. But, unfortunately, Republicans never do what they say they want to do. It was Arizona's Republican legislature that enacted this busy-body law to begin with (though, granted, our Democratic governor signed it). My grandfather, Vernon Brown, was an optometrist who started his practice in the mid-to-late 1800s. He did not go to school for the purpose. Instead, he bought a suitcase filled with eyeglasses of various strengths and went door-to-door with them. When a householder invited him in, Grandpa would offer pair after pair until the patient (called a "customer" at the time) found one that seemed to work. Grandpa would then sell it to him or her, and go on to the next house. As years pass, people's eyes change; people who didn't need glasses before may need them later; some people who did need then, might not now. But most people wearing glasses find, with time, that they need different lenses. No law needed to be passed to make these people realize their ten-year-old glasses no longer served them. They simply called Grandpa on the phone and asked him to drop by; or, by the 1930s, came to his new and modern optometrist's office to be examined and fitted for a new pair. By now, Grandpa was Dr. Vernon Brown. He had gone neither to medical school nor optometry school. People initiated calling him "doctor" simply because they acknowledged his skill and expertise. In those days, that's all it took. There was no shortage of business, either. Long hours of childhood spent reading and studying to meet the new educational demands of the early 20th century had produced a generation of largely near-sighted adults. 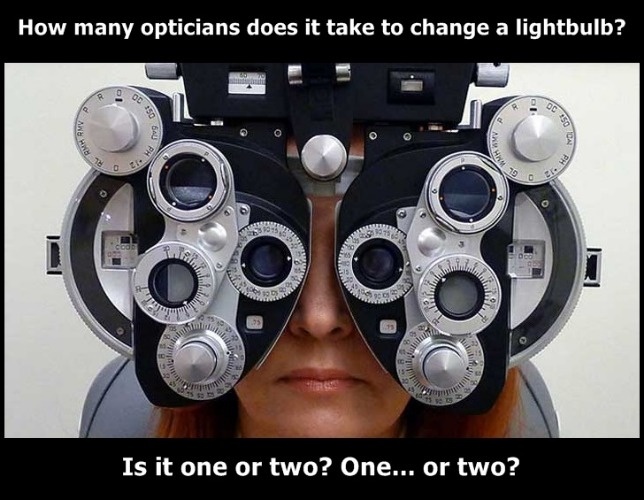 Optometrists were not in competition; they all had more customers than they could service as it was. Grandpa's best friend was another optometrist, Dr. Walter Glaeser; Grandpa posed as Uncle Walt's "patient" when pictures were taken of Walt's new office. Of course, in those days, the shop was owned and operated by the doctor, who also hired and paid a receptionist and, usually, an optician who actually ground the lenses to order, since that task was done in-house in those days. My mom served as my grandfather's optician for many years; she had obtained no formal training, either. Grandpa had learned to grind lenses by necessity, and he passed the skill on to her. Those days are gone. While no law exists to prevent a newly polished optometrist from opening his own shop, economic realities do. 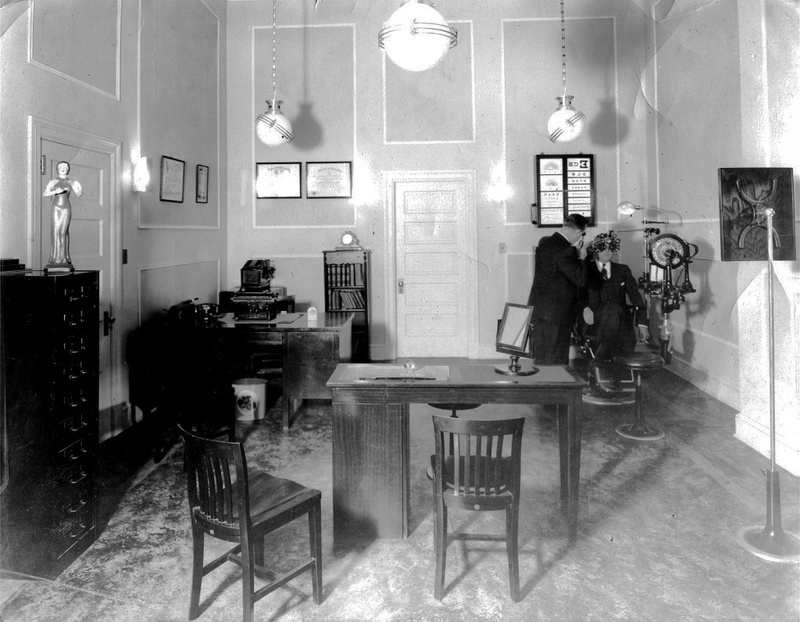 The equipment to outfit a modern optometrist's office, from the specialized automatic refractors and glaucoma testers through the less-specialized adjustable examining chairs and the unspecialized computers, cost a fortune. Most optometrists, already staggering beneath a student loan debt that will take them years to repay, opt to simply join a corporate chain that will underpay them so that they never will be able to afford their own shops—but can work and make payments on that student loan. And what happened to optometrists as individuals, in turn happened to the corporate shops as they merged into one or two. You recognize the brand names of LensCrafters? Pearle Vision Centers? Sunglass Hut? 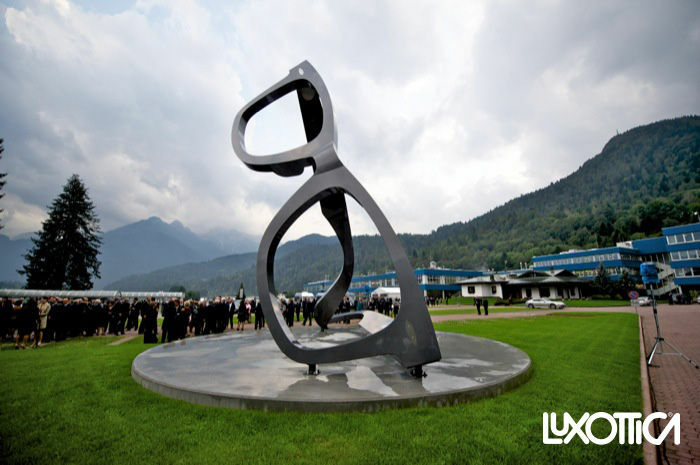 All are owned by the same Italian company, Luxottica Retail, which just yesterday announced it would buy its American sunglass rival Oakley for 30 times Oakley's expected 2007 earnings. And the worst of it is, this optical conglomerate was neither started by, nor is owned by, actual optometrists. But that doesn't stop them from lobbying (bribing) politicians to pass laws favorable to their industry—an industry that is, in fact, a monopoly. And that's what's behind laws passed with no purpose other than to increase profits. It sounds good to pass a law "for the good of the people" but such laws assume that "the people" are rather stupid children who can't care for themselves as well as strangers—not even in such an intimate issue as to how well they can see. So now, millions of contact lens wearers will find themselves getting their eyes unnecessarily examined, even when they know their eyes haven't changed, to be assured of that fact by an employee of Luxottica. The Arizona legislature, which surely has no idea what it did much less where the idea came from to begin with, has made certain that just a little more money than before will be flowing from the pockets of Arizonans to the wallets of Italian corporate kings. Okay. Back from the cruise and having worn my last pair of contacts for almost a month, yesterday I dropped by the Vision Center for my examination. I had my eyeballs puffed to see if I'd developed glaucoma in the past year (I hadn't), read numbers from a chart to see if I'd inexplicably lost the ability to discern colors (I hadn't), announced which was better, "One or two? "Three or four?" and recited the bottom line of letters from a projected eye chart. Precisely the same lens prescription I had last year. So, now I have the same prescription…but less money. And I didn't need any lenses to see that coming.